If you have ever thought of building a tree house it makes sense to heat it properly so that you can get the maximum use out of it. After all, what could be nicer than having a drink of an evening, followed by a light supper perched high up amongst the branches of a tree, all the while staying beautifully warm even when the night is cold - the perfect place to unwind with friends or just on your own when you want to unlock your creative spirit. The beauty of installing a woodburning stove into a tree house or forest cabin means you have the freedom to site the tree house anywhere where you have the most suitable tree. There is almost certainly going to be a ready supply of timber at hand, so it makes sense to use it. Running any other form of heating can be very expensive and does not sit comfortably within the environment. It may sound like a huge fire hazard putting a wood stove in a tree but that is not the case if it is installed correctly with suitable protection. 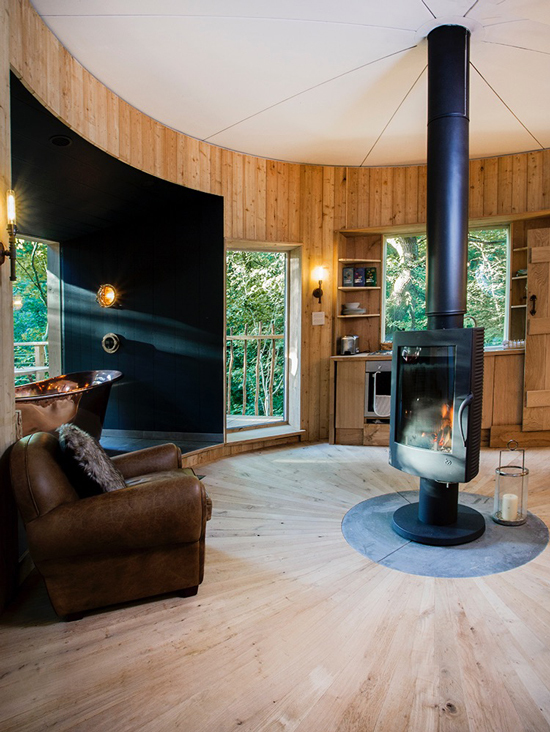 You might be interested to know that Centreparcs have installed woodburning stoves in their new exclusive treehouses in Sherwood Forrest and Longleat. There is a wide range of suitable stoves for you to choose from, depending on the size of your tree dwelling and the style of the interior. You may wish to stay with the traditional look, choosing a Mendip Stove, or Aarrow Ecoburn Plus for example, or you may want to go for something completely different, like a Opus stove, or a Fondis insert stove. The stove will need to be sited on a non-combustible surface, a hearth. It is important to choose a stove that has been tested to be suitable to go on a 12mm hearth. You don't want to be lugging a 250mm thick piece of concrete into your tree house. You will almost certainly need to provide a fireproof barrier at the back and sides of the stove using vermiculite fireboard. For the larger, luxury, well-equipped tree house you might consider a boiler model which will provide hot water, although you can always put a kettle on top of the stove which would give you enough warm water to wash up a few glasses. The insulated twin-wall flue should be as straight as possible, leading either from the back or top of the stove, through the roof or wall of the treehouse, straight up through the limbs of the tree. You may need to cut back branches to make a clear way through for the flue. There should be at least a clear air gap of 50mm between the insulated steel flue and the tree trunk, any leaves, twigs, or branches. At the point where the flue system penetrates the roof or wall of the tree house it is important that the correct flashing, or seal, is fitted. We have a full range of flashings to suit different types of roofing material. You should not use the tree to support the flue, so alternative fixings are required. The flue system will have to be held firmly in place using guy wires, the Selkirk roof brace kit can be adapted for this purpose by attaching longer guy wires right down to the ground. The stove is not able to support the weight of the flue system so this needs to be borne in mind. We would recommend that the chimney is checked twice during the growing season to make sure that no leaves have grown into the 50mm clearance space. Regular pruning is essential. The height of the flue system will depend on the height of the roof of your tree house, the height of your tree, and the situation that the tree is growing in. If your tree house is sited deep down in a sheltered dip in your garden, or field, the flue will have to be longer than it would be if the tree house is sited in an open clearing, making sure that the smoke is emitted well away from the treehouse. However, a little smoke wafting about will keep the mosquitoes and midges at bay. Stovesonline has all the expertise needed in advising you on installing a stove in your tree house safely. We can also supply you with the most appropriate stove and the flue system.